PARIS --- Airbus delivered a total of 17 A400M military transport aircraft in 2018, two more than it planned but two fewer than the 19 it delivered the previous year. These deliveries bring to 74 the total number of A400M production aircraft delivered to date, reducing the number of outstanding orders to 100. Germany’s Luftwaffe took ten of the aircraft delivered in 2018, while two each went to Spain, Turkey and the UK, with a single aircraft delivered to France. Despite the aircraft’s uncontested capabilities, no additional order has been booked, and repeated Indonesian ministerial statements of an imminent order have not yet materialized. Fernando Alonso, the president of Airbus Spain, said in July that six firm offers had been submitted to prospective customers, two of which were under negotiation at the time, and one of which he hoped to conclude by the end of the year, but Airbus has not reported any progress in this respect. At the time, Alonso also said 2018 deliveries would fall to 15 aircraft, but the fact that the year ended with two additional deliveries points to faster-than expected assembly-line improvements. It remains to be seen how this improved performance will translate into financial terms, and whether the additional revenue generated by the two unplanned deliveries will be offset by financial penalties or more charges. This appears unlikely, however, as no new problems have surfaced since the A400M partner nations met in London on Feb. 5, 2018 to discuss the program’s progress. On that date, the partners signed a “high-level Declaration on Intent to re-baseline the A400M programme, reflecting the latest status of the production and capability delivery plans,” according to their joint statement. At the time, Airbus Chief Executive Officer Tom Enders said "This agreement with our customers is an important step to further mitigate risks remaining on the A400M programme. I thank the nations for their support in this complex effort and hope for their continued engagement until we sign a mutually beneficial contract amendment." No new contract amendment has been made public to date, and neither had it been signed when Enders announced the company’s third quarter results on Oct. 31. “On the A400M, …. contract amendment discussions are advancing, but a bit slower than planned,” he said. This confirms comments made by Joel Barre, France’s director-general of armaments, during an Oct. 10 hearing before the French Parliament’s defense committee, when he confirmed that “We have run into some difficulties in the negotiations between OCCAr and Airbus, and between OCCAr and the six participating nations.” OCCAr, the European defense procurement agency, is the executive agency for the A400M program. In any case, Airbus has already decided to halve the A400M production rate. The company in March informed its European Works Council that A400M production would drop to 8 aircraft per year by 2020, which means it will be stretched out over the next decade, assuming this year’s deliveries will total 17-18 aircraft. Stretching out production will give Airbus more time to look for additional customers, while upgrading the aircraft already delivered to bring them up to contractual standards. 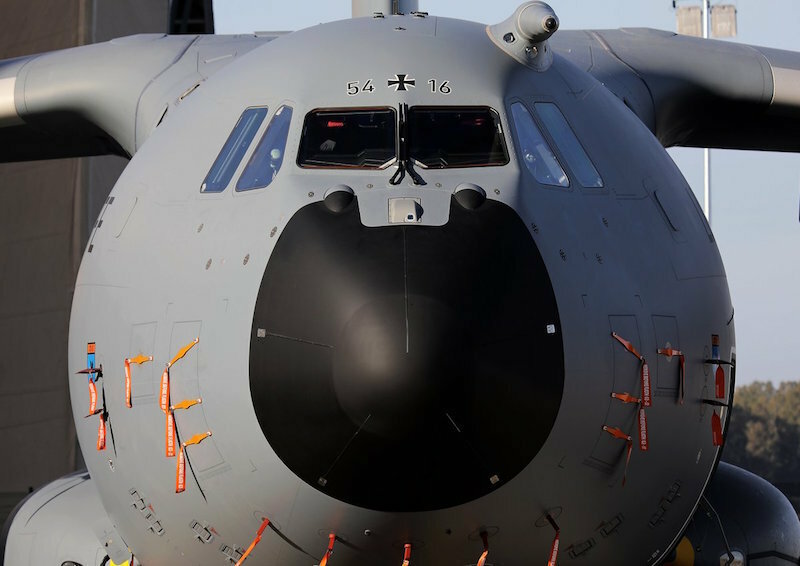 Germany currently operates the largest fleet of A400Ms, with 25 aircraft, closely followed by Britain’s Royal Air Force with 20. France has received with 14 and Turkey seven, while both Spain and Malaysia have taken delivery of four aircraft each. In addition to the 74 aircraft delivered, Airbus has manufactured eight other A400Ms: five Grizzly development aircraft, one British aircraft used for trials and one aircraft described as a “white tail” – produced but not assigned to a customer. Finally, one aircraft was written off after crashing on take-off from the Airbus plant in Seville on May 9, 2015, killing all four crew. France has the largest number of outstanding orders as of Dec. 31, with 36 aircraft to be delivered out of the 50 it has ordered. It is followed by Germany (28 aircraft outstanding), Spain (23 aircraft), Belgium (7 aircraft ordered, none delivered), Turkey (three), the United Kingdom (two, including trials aircraft MSN 056) and Luxembourg, whose single A400M will be operated jointly with the Belgian Air Force.